a life and times of Zhang Dai (Chang Tai ; 1597–1689), a prolific author of memoirs, histories, biographies, poetry, dramas and essays. One of the many matters contributing to a yet lively interest in Zhang is that when the Ming dynasty collapsed in 1644 under the blows of the invading Manchu, Zhang's privileged life as a wealthy scholar and literatus came to a violent end, as did many members of his family. However, instead of committing suicide, as did his best friend and many others of his acquaintance, or collaborating with the victors, he lived modestly in exile and wrote madly, trying to recreate the lost world of the Ming with ink and brush. Spence used all of Zhang's writings as primary sources for Return to Dragon Mountain. 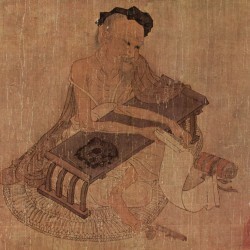 Zhang Dai of Shu. His sobriquet was Tao'an. In his youth he was a fop. He had a great love of ostentation, being fond of luxurious quarters, pretty maids, beautiful boys, fresh clothes, fine foods, fast horses, painted lanterns, fireworks, opera, music, antiques, and flowers and birds. At the same time, he was excessive about tea and abusively fond of oranges, and was a book worm and a poetry demon. He toiled at those pursuits for half a lifetime, when all turned into a dream-illusion. In Limpid Dream originated as a Ph.D. dissertation in which, as Kafalas explains, he initially wanted to work out a poetics of xiaopin (hsiao-p'in), a genre of informal, personal essays that avoid the rhetoric of persuasion or moral didacticism dominant in Confucian influenced literature, i.e. most of Chinese literature. However, Kafalas found that the closer he looked at the commentary and exemplars of this genre, the less genre he found. But I am not going to enter into this technical point in this review. The primary interest in this book for the non-specialist like myself is Zhang's text and Kafalas' commentary on it. In addition to providing background of all sorts, Kafalas provides a detailed examination of Zhang's text in the first half of the book. He also translates and comments upon textual variants of Tao'an Mengyi, as well as relevant passages from other texts by Zhang. I acknowledge that one person's fascinating detail is another's boring superfluity, but I found Kafalas' remarks and analysis to be generally interesting. The text consists of 123 short vignettes, brief descriptions of places, events, people, all gone when Zhang wrote these pieces but all part of his life. But it is not an autobiography at all; it is a glimpse of the motions of Zhang's mind as he tried to establish both a refuge where he could withdraw from the sorrow and troubles of the new China to the quieter sorrow of nostalgic loss, and a small retort where portions of his spirit could be sheltered from the gusts of time and be preserved for like-minded persons in future, better times. Like us. These motions are made corporeal through a prose style that is difficult to describe briefly. It is nimble, quickly moving from awe to deflating wit, from colorful and intense description to a telling satire (kudos to Kafalas' translation - one can only wonder at the Chinese original, described by a mid-nineteenth century Chinese commentator as "almost causing the reader's mind and eye to become giddy"), completely unique, and completely itself. (***) There is internal and external evidence that the text was written over a span of many years towards the end of his life, and that it was revised again and again with an eye towards concision, precision, surprise and wry humor. present beneath the moon but really not looking at the moon at all. people are looking at them looking at the moon. singing without the benefit of a tune. some flee the noise at the inner lake. unseen by others, nor do they make a point of looking at the moon. In the second half of the book Kafalas returns to his original intention of working out a poetics of xiaopin. As mentioned, this is probably not the forum for such matters, but I learned much from his discussion and do recommend it to your attention. (*) Owens translates and analyzes only the "preface" of Dream Reminiscences of Tao'an in his Remembrances, as this provided the best grist for his mill. which I have just gotten my hands on through an interlibrary loan and am reading with great interest, but it seems that there is no complete English translation available. (***) And never weepy - in case you may be worried, there is not a hint of self-pity in Zhang's text, even when he writes, exceptionally, of the destruction of his enormous private library. This is one of the few instances in which he writes directly of loss, for one of his primary aims is to summon the moments, places and people as they were, to remove the layers of intervening time and preserve them in their pristine state. He writes of his library and its ruin (and that of his grandfather's) relativized in a poignant larger context of collection and dispersal, collection and dispersal.